Take an exotic adventure to the plains of South Africa, with opportunities to see Africa’s ‘Big 5’ awaiting at every park, forest and game drive, witnessing the world’s most majestic wildlife in their natural environment from just metres away! 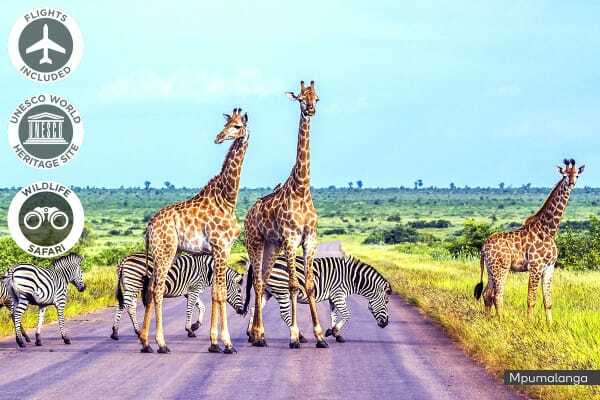 Get up close and personal with Africa’s ‘Big 5’ on this incredible South Africa Safari, weaving your way through lush landscapes, breathtaking natural marvels, gaping waterfalls and tranquil rivers along the African bushveld to witness fabled wildlife in all their glory. Feast your eyes on the scenic Panorama Route, where the gaping beauty of the Blyde River Canyon, the natural geological marvel of Bourke’s Luck Potholes and the breathtaking scenery from Gods Window await. Spy your share of majestic wildlife in Kruger National Park. From the likes of elephants, lions, leopards, rhino, buffalo and giraffes, be awestruck by stunning wildlife that looks its been lifted straight from the pages of National Geographic! See the game reserve come alive at night as you embark on a night drive through grassy savannas in search of lively nocturnal wildlife. Marvel at the size and might of Victoria Falls, known locally as ‘the smoke that thunders’. Seeing and hearing its powerful waters crashing into the mighty Zambezi River is truly an unforgettable experience. Pack your bags for an adventure of a lifetime as you board your international flight to Johannesburg. Touchdown Johannesburg! Upon arrival, you’ll be transferred to your lodge where you can unwind from your long flight or spend the remainder of the day exploring the city. Drive past stunning mountain vistas, lush green valleys and arid bush this morning as you wind along the scenic route to Mpumalanga. Stop in the historic township of Dullstroom for lunch, before winding down the Drakensberg escarpment into the untamed Lowveld. 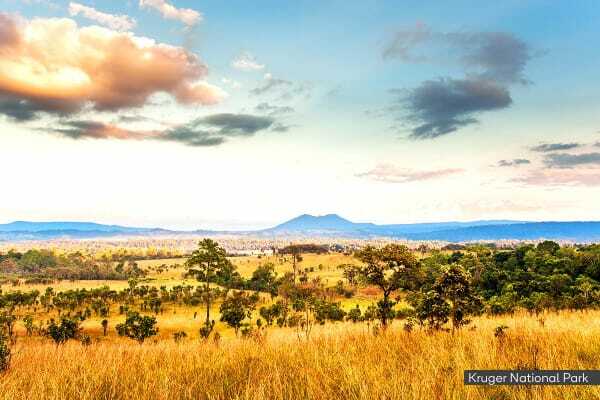 Arrive in the Kruger National Park greater area, where Africa’s gems roam freely. Enjoy dinner tonight cooked over a traditional open fire. Start your morning with a light breakfast before embarking on a guided game walk to witness the Big 5 in action; lions, elephants, buffalos, leopards and rhinos. Return back to the lodge for a sumptuous brunch, basking in the serenity of the wilderness. Spend your afternoon on an open vehicle game drive, searching for Africa’s majestic wildlife. Enjoy a ‘sundowner’ drink as the sun sets over the bushveld before continuing your game drive into the night. Savour a hearty bush braai cooked on an open fire for dinner. Rise with the Africa sun this morning, watching as the sun rises over mountainous vistas and red stone facades along the Panorama Route, en route to Hazyview. 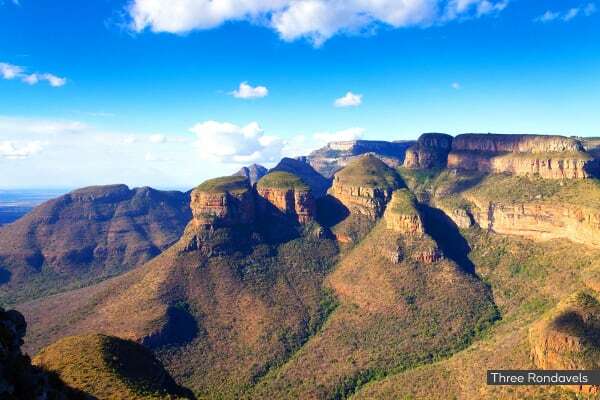 Admire how the Blyde River Canyon carves its way through expansive red sandstone, before continuing to God’s Window for breathtaking vistas of the Drakensberg Escarpment and Bourke’s Luck Potholes’ collection of waterfalls and distinctive rock formations. Time permitting this evening, you’ll be able to enjoy a nature walk in the surrounding forest before dinner. More magnificent game viewing is on the agenda for today, as you rise early to tackle another section of Kruger National Park’s rugged plains in search of the African Big Five. Enjoy a leisurely breakfast before travelling back to Johannesburg. Take a morning flight to the picturesque and thundering Victoria Falls in Zimbabwe. The Falls are a little over a mile wide and 351 feet high, making them one-and-a-half times as wide and twice as high as Niagara Falls. 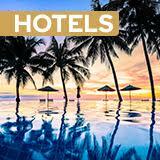 Here, you can still encounter herds of buffalo and elephants on their way to the Zambezi River. 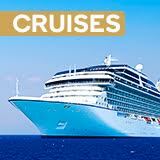 In the late afternoon, enjoy a sublime sundowner cruise on a broad sweep of the mighty Zambezi River. This morning, enjoy a guided tour of the Victoria Falls, one of the “Seven Natural Wonders of the World”. The walking safari takes you through the magnificent rain forest to view the Cataracts, Livingston’s statue and a wide variety of birds and plants. The rest of the day is yours to discover this beautiful area at leisure. Leave the Falls behind this morning as you fly to Johannesburg for your return flight home to Australia.